Well I’ve just arrived home from a lovely holiday on the Sunshine Coast of Australia, where I’ve been enjoying my fair share of fresh tropical fruit (in abundance!! ); passionfruit, lychees, watermelon, mangoes... SO so good! Some of my holiday highlights mirror last years trip; waking up to the sound of crashing waves, visits to the local farmer’s market to pick up produce for the week, lounging by the pool reading a book, beach walks, exploring the coastline, and dinner dates with the husband (follow along on Snapchat for some behind the scenes fun @gatherandfeast). For this week’s recipe I thought I’d capitalise on all the beautiful fresh produce we have in Australia right now and create this amazing frozen fruit and nut grazing board! 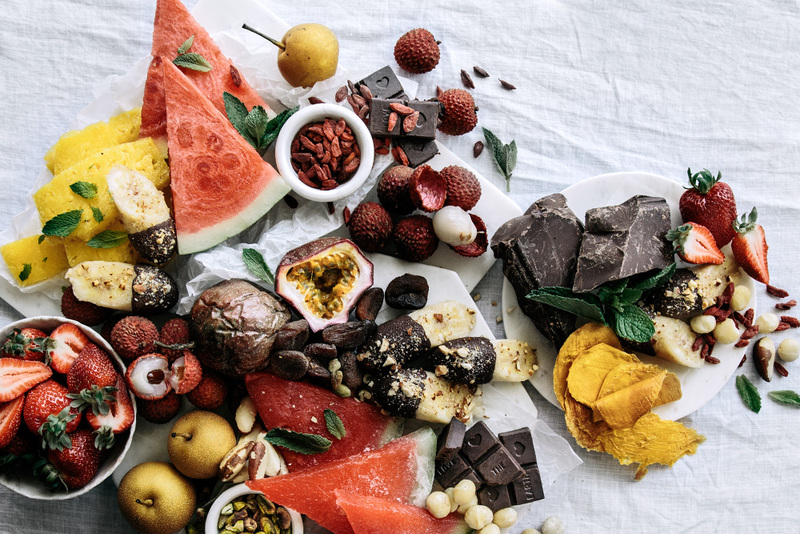 This board is jam packed with frozen bananas dipped in dark chocolate, frozen pineapple and watermelon sprinkled with mint and pistachios, fresh passionfruit, lychees, strawberries, dried mango, dried turkish apricots with brazil nuts, almonds, macadamias, goji berries and fresh mint! YUM! You can create this grazing board concept at any time of the year, using produce in season at the time. It's a great throw it all together, super easy entertaining dessert, with a little something for everyone. During the autumn/winter months I usually use fresh and poached pears, fresh and baked apples, persimmons, roasted almonds, chestnuts, dark chocolate, and maybe even some gingerbread for a little sweet treat. Enjoy creating your own fruit, nut and chocolate grazing board and don't forget to tag me @gatherandfeast and #gatherandfeast so I can see all your wonderful creations! Slice bananas in half and place in the freezer overnight. Remove the frozen bananas from the freezer and dip into melted chocolate. Slice the watermelon and pineapple and place into the freezer until frozen (I like to put mine in an airtight container separating the layers with baking paper). Arrange the frozen fruit, fresh fruit, nuts and chocolate onto a large serving board, sprinkle with fresh mint (and edible flowers if you have some) and enjoy with friends! I had the privilege of experiencing some of the most amazing food and local fresh produce on my recent trip to Europe. One of our weekend favourites is this week's buckwheat blueberry and ricotta hotcakes recipe.